Hike the highest mountain in North Africa. 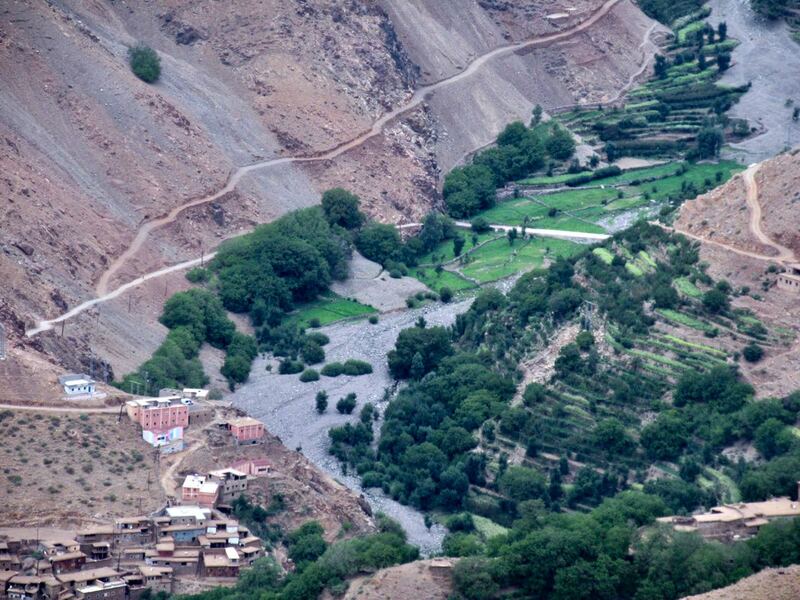 Learn about Berber culture in the High Atlas mountains. Morocco’s most popular outdoors destination. 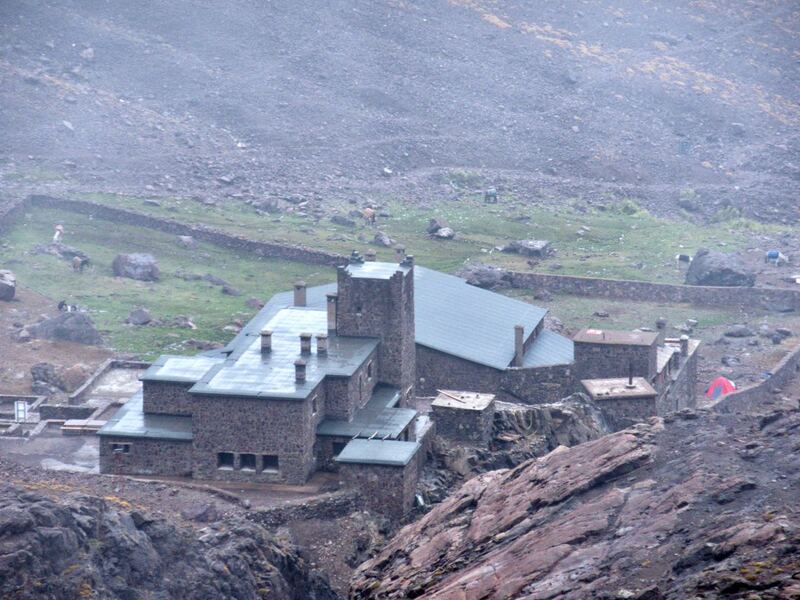 most people tent though you can stay indoors in the Refuge du Toubkal at base camp. Local Berber people also offer beds / camping in their homes at low cost. with an extra day you can add a climb of Ouanoukrim, second highest peak. It has two summits, Timzguida (4,089m, 13,415ft) and Ras Ouanoukrim (4,083m, 13,396ft). no insect pests. It’s too dry and windy. good gear shop in Imlil — Atlas Extreme — sells and rents everything you might need. It was closed, however, during the week we were there. meeting the mountain Berber people. You can ask to stay in their home Gite d’Etapes in the villages if you like. the route is on Maps.me, a free offline app. Before you get there you need to download the map to your phone. good footwear and windproof / waterproof clothing needed. Many arrive from Marrakesh unprepared. Expect hot sun, rain, hail, snow and wind … all on the same day. weather at the top of the mountain is changeable. And can be quite different than down below. We had lightning up high the day of the climb. surprisingly water is an issue. Treat ALL water unless you see it coming out of the mountain with your own eyes. There are long sections without water late in the summer. standards of hygiene are low. Human excrement is everywhere. Especially near popular group campsites. this is a route, not a trail. Footing is rocky and can be unstable. 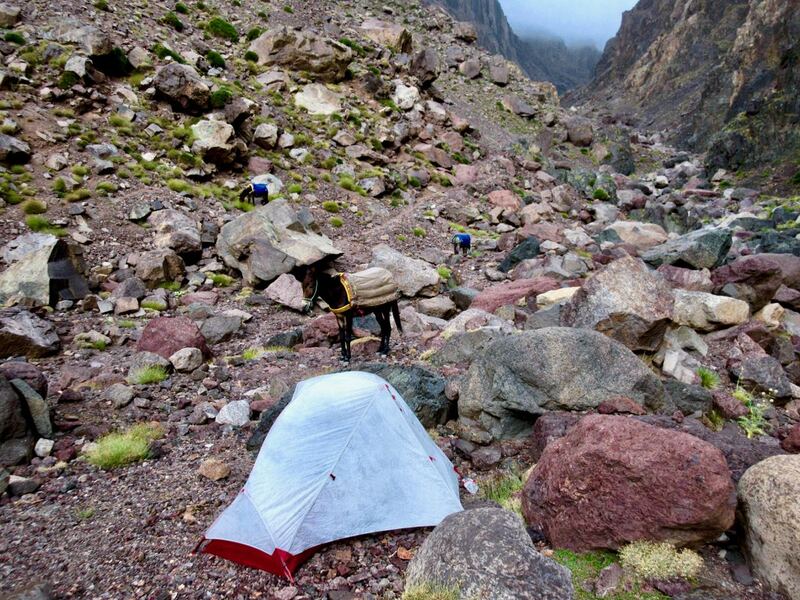 The vast majority of hikers do the Circuit with guide and horses carrying their gear. We saw groups from Germany, France, Ukraine, Iceland and the U.K. the week we were there. If you arrive at the village early enough you could hike to the lake on day 1. At the bottom of the pass is the start of the climb to Ouanoukrim, second highest peak. If weather cooperates, and you have the energy, it’s well worth climbing at least part way up as acclimatization for Toubkal next day. That route is on Maps.me, as well. You can stay the night in Imlil or try to find transportation back to Marrakesh same day. Note that’s over 2400m of descent in one day! You’ll be feeling it. 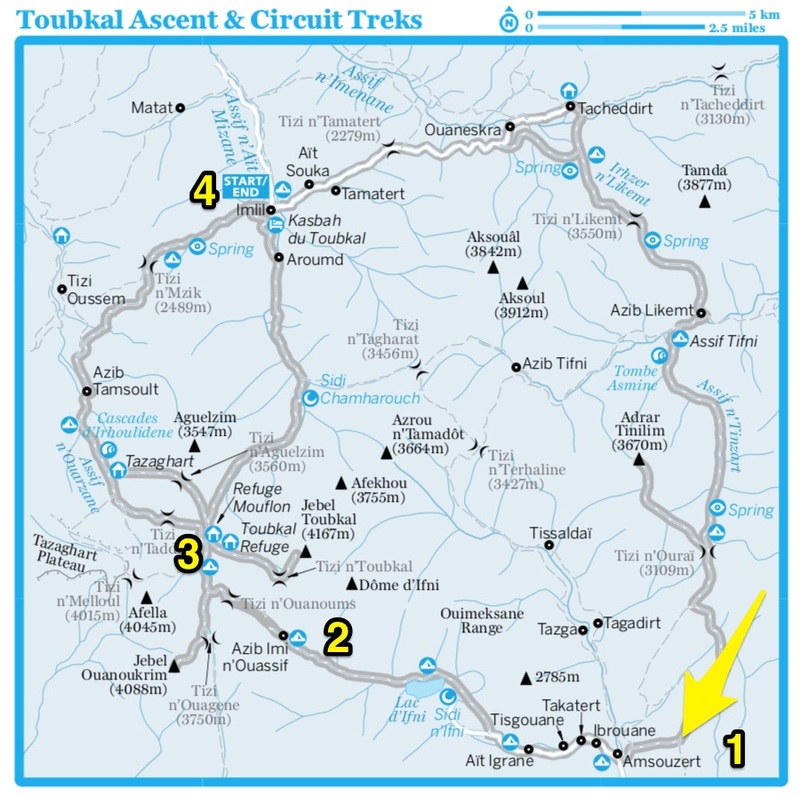 We did the full circuit in 2018 and found it a mistake to do a paved road walk Imlil to Tacheddirt on the first day. Then make a climb to a 3550m pass on the second day. That was poor acclimatization. You will need to organize transport to Amsouzert. Getting your hotel in Marrakesh to phone a cab for you would be the easiest way. There are many trekking guides. Many groups during high season. All seem to hire the same local guides, cooks and horsemen. It may not matter much which you join. 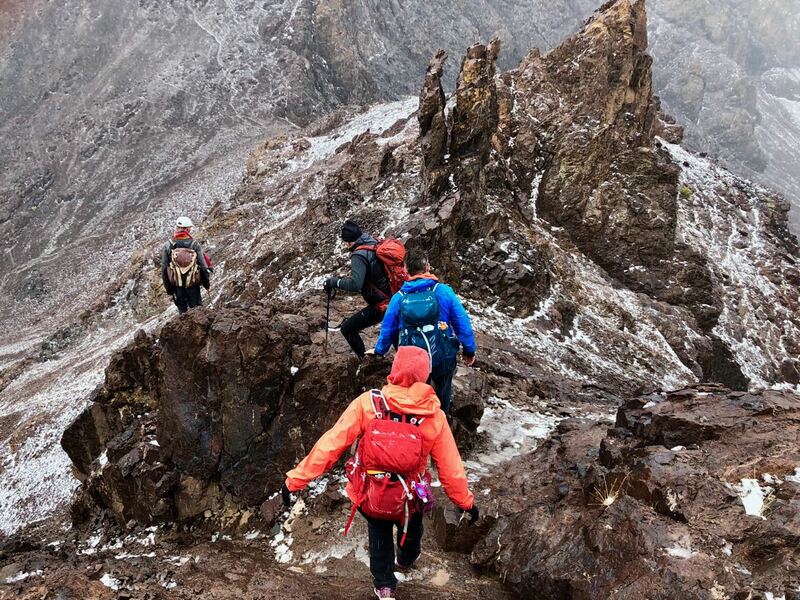 Our impression was that these guided treks were inferior to similar ones around the world. None we saw have toilet tents, for example. Clients all go behind whatever scant rock covering is available close. Horse drivers emulate their beasts. Many go right on the trail when the moment strikes them. No toilet paper. No washing. You could hire a guide when you get to Imlil. One American woman asked there for a guide who spoke English or French. She got one who spoke only Spanish, Berber and Arabic. 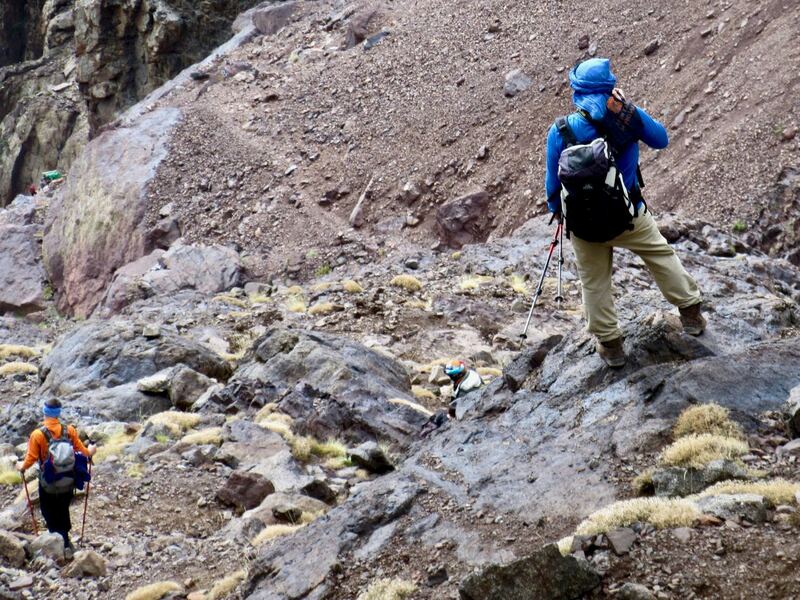 Happily it’s easy to climb Toubkal independently. 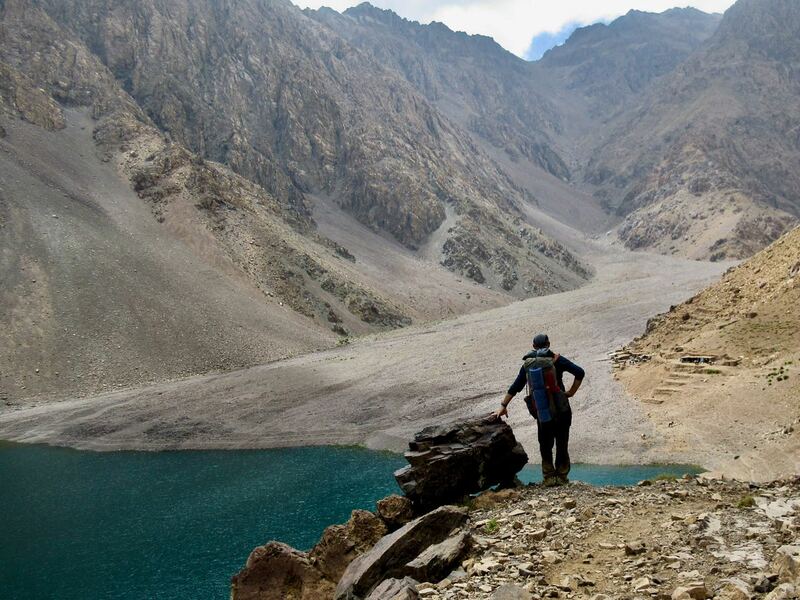 For experienced hikers, organizing transportation to Imlil might be your greatest navigational challenge. Wait in Marrakesh watching the weather report. When it looks like a good window is opening up, hop in a cab. That’s the easiest way. 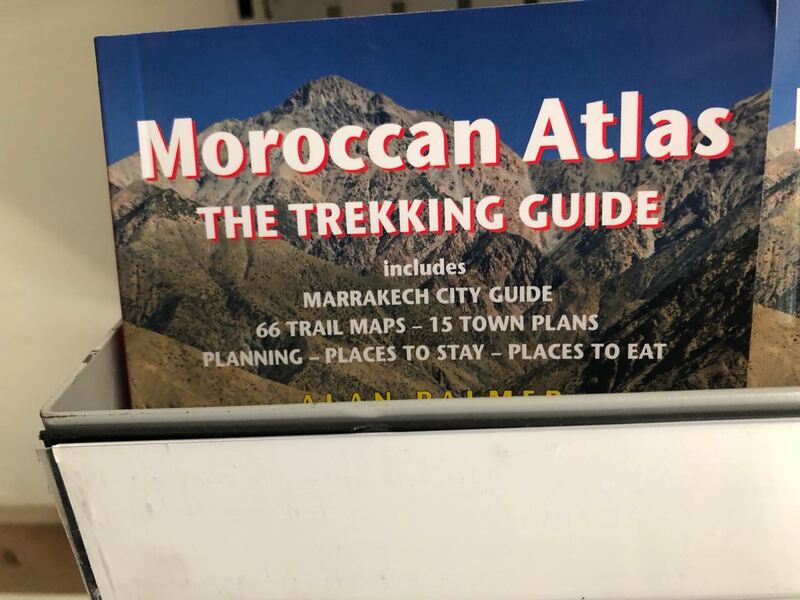 We tried to buy this guidebook in Marrakesh. It wasn’t available. So we planned to buy it on arrival in Imlil. But the shop was closed the week we were there. Sadly Trailblazer doesn’t offer a digital version. You have to get your hands on a dead tree copy. We recommend you order it online in advance. Lonely Planet Morocco. Get the most recent edition. One old map is available in Imlil for about $10. We found it fairly useless as it doesn’t include most trails. BEST is to download the Maps.me app to your phone. And make sure you don’t lose, break or run out of battery power in the mountains. Click PLAY or watch a 2 day guided trek on YouTube. Click PLAY or get a glimpse of Rick McCharles’ 2018 solo independent circuit on YouTube.